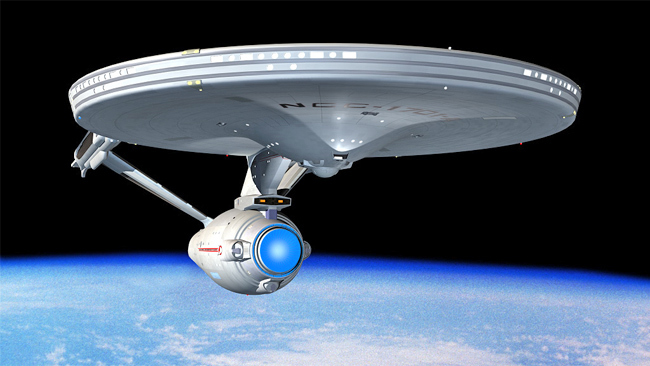 Electric propulsion is not news to Star Trek fans, but NASA's suddenly excited about it. Picture courtesy ParamountPlanetary travel "within few years"Funded by DARPA, NASAFirst stop - moons of MarsA SENIOR NASA official has promised to deliver a spaceship that will travel between alien worlds "within a few years". The project was kicked off recently with $1 million funding from DARPA and $100K from NASA and hopes to utilise new propulsion ideas being explored by NASA.Star Trek fans, prepare to get excited - electric propulsion is here, according to Mr Worden. Mr Worden said he hoped to "inveigle some billionaires" such as Google founder Larry Page to help with further funding for the project. Another possible source of propulsion being funded by NASA was by using microwave power from a planetary base to heat hydrogen propellants on board an orbiting spaceship." Mr Worden had an interesting take on how we would settle other worlds when we found them, suggesting it would be easier to adapt humans to an alien planet than changing the planet to suit humans.“How do you live in another world? I don’t have the slightest idea,” he said. “If you’re a conservative, you worry about it killing us; if you’re a liberal, you worry about us killing it. "Despite his ambitious vision to push further out into the galaxy, Mr Worden said there was still plenty of work to do in our own backyard first. First stop, he said, was the moons of Mars, from where the planet itself can be explored using telerobotics.“I think we’ll be on the moons of Mars by 2030 or so," he said."